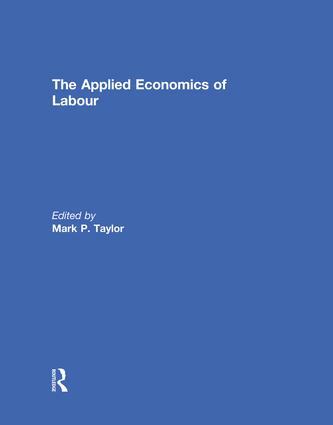 This book provides an introduction and overview to seven applied financial studies on the theme of labour. The studies cover a wide range of topics, from the individual effects of becoming disabled on key aspects of labour market outcomes in Germany, to testing whether there is evidence of compression of morbidity using Health and Retirement Study (HRS) data and analysing the effects of this on the labour supply of older people. The studies employ a variety of applied techniques across a range of countries. This book was originally published as a special issue of Applied Economics. Mark P. Taylor is Dean of Warwick Business School, UK, and is a leading international authority in open economy macroeconomics and international finance. Although interested in broad research subjects, he focuses particularly on empirical work on exchange rates. Amongst his many published works are studies on the presence of nonlinearity in real and nominal exchange rate movements, on the long-run behaviour of real exchange rates, on the nature and effectiveness of official foreign exchange market intervention and on the micro-structural effects of European Central Bank interest rate announcements.